I’m perplexed. For months, Mason loved butternut squash. Loved it. It was his first yellow veggie. He ate it plain, he ate it with chicken. He enjoyed it mixed with yogurt and peaches, and he loved the simple combination of butternut squash and apple. Now he cries when I try to feed it to him. What gives? Apparently this happens. Babes suddenly decide they don’t like something. And that’s it. I’m a bit sad — I loved that he loved butternut squash. It’s pure and simple. Wholesome, velvety, luscious. I felt good feeding it to him. And it’s so simple to make. Of course, I won’t feed Mason something that makes him cry. For now the butternut squash in my freezer will stay there. I’m hoping he’ll enjoy it once again. If he doesn’t we’ll share it with one of his little friends. In honor of Mason’s (former) favorite veggie, here are the butternut squash recipes he enjoyed for the last few months. (Before you get started cooking, don’t miss my guide to how to roast and puree butternut squash.) Try out our recipes and let us know what your babe thinks! 1. Scoop flesh out of a roasted squash. Discard the skin. 2. Puree squash flesh in a food processor. Add water until you reach a smooth consistency. For extra creaminess add a splash of pre-mixed formula, breast milk, or plain yogurt. 2. Roast butternut squash. Scoop flesh from shell. Set aside 1/2 cup. 3. Combine both the squash and chicken in a food processor or blender. Add cooking liquid or water until you reach desired consistency. (Think smooth but without being watery.) Freeze extras for up to three months. 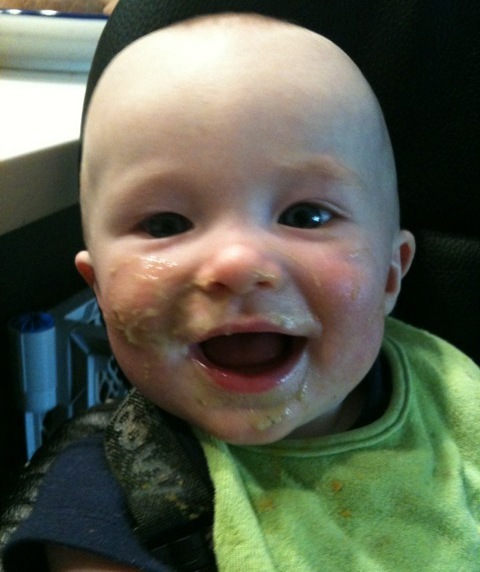 The first time I fed Mason Avocado-Banana Puree, I blew it. After his first bite he shuddered and looked offended. I coaxed him into taking a second bite and he gagged, then started screaming. Discouraged, I threw the rest of the stuff in the trash. In retrospect, it wasn’t about the fruit — both of which he loves separately– it was about my technique. 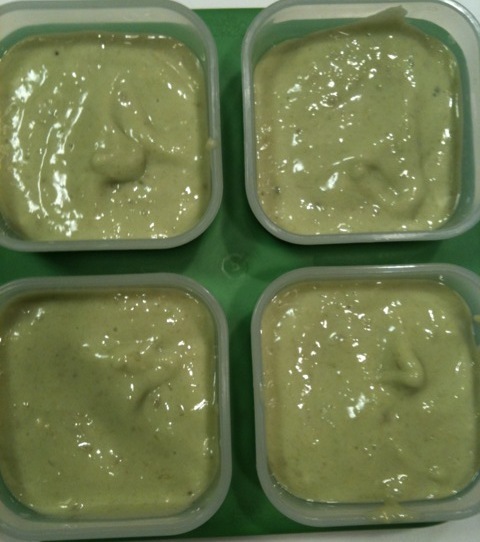 The unripe avocado that I used gave the puree a grainy texture (think brown mustard). I should have been more patient and waited for the avocado to ripen. The puree was also bland. It would have been better to use at least two bananas to add more sweetness and depth of flavor. Tonight I started my second attempt at Avocado-Banana Puree with very ripe fruit. I scooped the avocado out of its shell and sliced up the bananas. Then I pureed them together with premixed formula. The ultra-healthy fruits blended up fluffy and creamy. The puree tasted pleasantly sweet, without any graininess at all. Even my husband who usually refuses to taste any of Mason’s purees gave liked this one. I fed a spoonful of the puree to Mason and waited. He tasted it and instead of gagging or screaming he swallowed and opened his mouth for more. And more. He ate all two ounces of the puree and was smiling afterward (above). His reaction made my night! Here’s the recipe. Hope your babe enjoys it too. 1. Slice a very ripe avocado in half. Remove the pit. Set aside. 2. Peel and slice ripe bananas. Combine with the avocado. Puree the fruits together in a food processor. Add premixed formula until you reach a very smooth texture. What’s your latest and greatest baby food success?